SELF-SERVE FARM STORE. Open every day April – October, from 7a-7pm at 200 Creamery Road in Brooktondale. Cash or check only. Park in front of the barn and look for the doorway labeled “Farm Store.” The store is stocked with Shelterbelt products only: frozen cuts of lamb, eggs from our chickens, ginger syrup and candy, Aronia Cordial, raw honey, Praise the Lard balms, and seasonal goodies from our orchard and gardens. BECOME A FRIEND OF SHELTERBELT by signing up for our monthly farm newsletter. You’ll get first dibs on limited quantity products and get special deals only offered to newsletter subscribers. You’ll also be among the first to hear about special markets we attend 4-5 times/year. If you have questions or would like to buy our products, please contact us directly by phone (607-342-3771) or email. 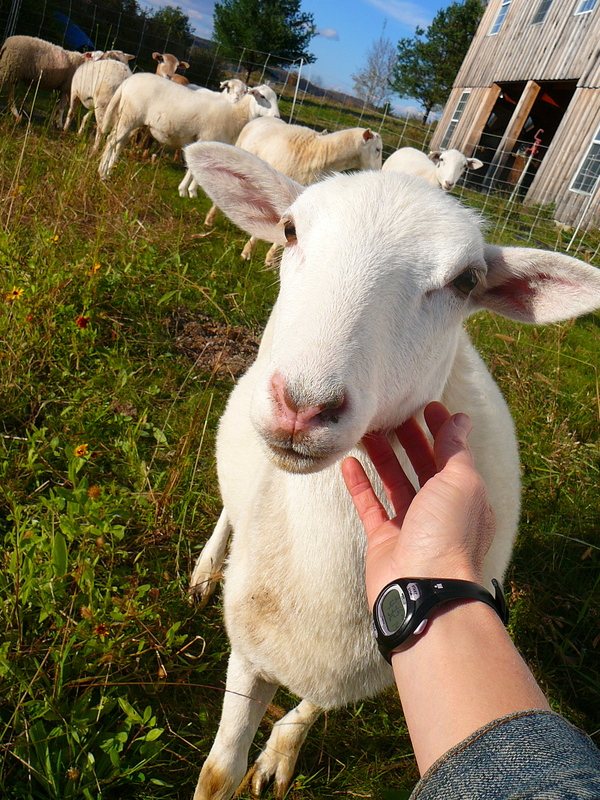 Our Katahdin-Dorper lambs produce mild, tender, heart-healthy and environmentally-friendly meat. We move them at least once a day around the farm, using grazing management as a tool to build organic matter in our soils. We have a mix of retail cuts available–from ground to stew meat, rack of lamb to leg roasts–in our farm store at 200 Creamery Road in Brooktondale. We also sell lambs by the whole and half and are accepting orders for lambs (available in November 2019). This is absolutely the most economical way to purchase local meat, as you get even the most expensive cuts at the lowest price. Also, a whole lamb only produces around 30 lbs of meat, so it’s not an overwhelming commitment! There are many options for cuts available from each primal; when you order we help walk you through these. These are $7.00/lb hanging weight (this is the weight at the butcher, after head, hide, and internal organs have been removed). The takehome weight of the meat you get is generally around 75% of the hanging weight. So, for a typical lamb with a hanging weight of around 40-55 lbs, depending on what cuts you want, you could expect a takehome weight of 30-40 lbs. The cost for this whole lamb would be $280 – 385, which includes the butchering cost and can be paid in 2 installments. Our supply never lasts long, so call us (607-342-3771) or use our online store to reserve yours today! Our black Angus cows were bred to be raised 100% on forage, so they don’t need to be corn-finished to produce beautifully marbled meat. If you’re new to cooking grass-fed meat, we can help with recipes to ensure a good eating experience! WHY BULK ORDER? You can save hundreds of dollars over buying individual cuts at market. For just slightly more than the retail price of ground beef, you get high-value steaks and roasts. Bulk purchasing is often cheaper than buying grocery store meat, with all the health, social, and economic benefits of buying local. WHAT TO EXPECT There are many options for cuts available from each primal; when you order we help walk you through these. COST AND QUANTITY $4.50/lb hanging weight – This is the weight at the butcher, after head, hide, and internal organs have been removed. The take-home weight of the meat you get is around 65% of the hanging weight. Hanging weight for a QUARTER is ~140-155lbs, so total cost would be $630-700, which could be paid in 2-3 installments. Price includes butcher fee. Your takehome weight will be around 80-100lbs, including bones and organs if you want them. If this is too much for you or your family, consider splitting a quarter with a friend! CUT PREFERENCES When you order a half or quarter animal, we work with you to learn how you want your meat cut, and give your customized instructions to the butcher. Prefer steaks over roasts? Like stew cuts over ground? No problem – we can accommodate most of your preferences, within reason. AVAILABILITY Halves and quarters of beef will next be available in December 2019, by reservation only. RESERVE YOURS – Reserve now to fill your freezer or Meat Locker bin for the long Winter! $100 deposit holds your reservation. Our orchard contains 5 apple varieties (Goldrush, Honeycrisp, Enterprise, Liberty, and Golden Russet), 3 varieties of peaches, 2 types of Asian Pears, and an understory of honeyberries (aka Haskaps), aronia, and juneberries. We manage the orchard biodynamically, which means we aim to support beneficial ecology in the orchard and take a probiotic approach to producing tasty, nutrient-dense fruit. Basically, we don’t spray anything harmful to human health, organic or conventional. How can you get this fruit? Become a member of our u-pick! We will open the orchard for picking only by members (and their guests). Join for a year, pay $50, and get your first $50 of fruit free. Get a discount on any fruit you harvest beyond that first $50. As a bonus, you can help shape future plantings in the orchard, and get to spend time hanging out in a beautiful orchard picking deliciously flavorful fresh fruit. Starting in 2019, we will have a new partnership with local beekeeper Bob Finch to manage hives on our farm. In this way we will still be able to harvest the bountiful nectar flows on and around our farm–which feature Black Locust, Basswood, Sumac, Knapweed, Knotweed, and Goldenrod–and benefit from the bees’ pollination services, without having to manage the hives’ health ourselves. Did you know honey is the only food that never spoils – it’s edible even after thousands of years (though it would never last that long in our house!) Our Fall honey crystallizes rapidly into a lovely creamy, spreadable consistency, which can be re-liquified by gently heating it. Lard from pastured pigs + wax from our bees = bliss for wind-battered, dried-out, or rashy skin! 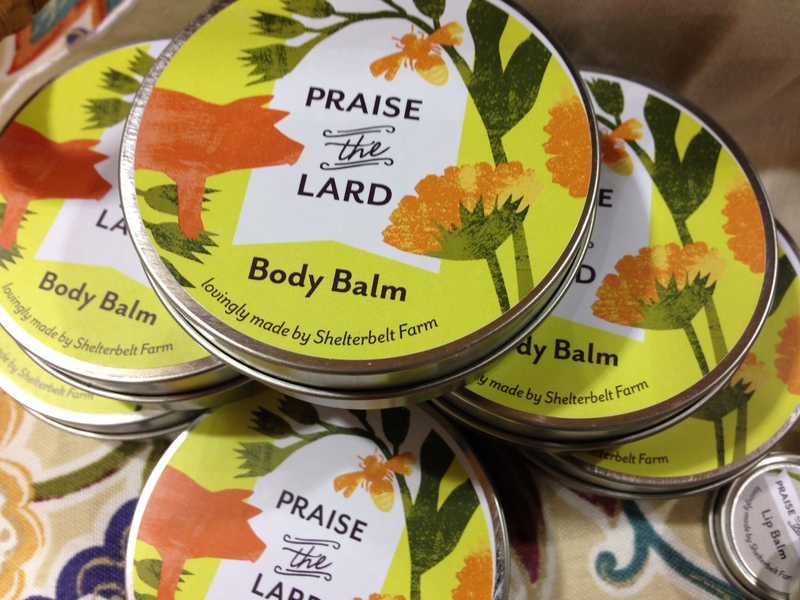 Warning: Once you’ve tried “Praise the Lard” balms, you’ll never go back! We have them available as 4 oz body balm, 4 oz diaper balm (perfect for preventing or healing diaper rash! ), and .25 oz lip balm. All 3 are infused with organic comfrey and calendula for skin healing, and scented with lavender essential oil. We use them for any skin irritation on any part of our bodies, and they’ve never disappointed us! Good enough to eat! Sorry, no bacon balm yet. The baby ginger will be here again this Fall! Nothing like the brown leathery-skinned ginger you can buy at the store, this is fresh, juicy, and less fibrous. Pickle it, juice it, make tea with it, candy it! It’s good just about any way you use it. And if you don’t use it often, you can freeze it, then pull it out to grate or slice and re-freeze. Our ginger is grown using only organically-approved amendments. Available for a very limited time, from Sept-Nov 2019. 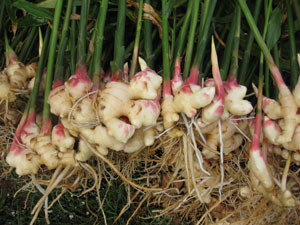 We start with baby ginger, add honey, sugar, and lemon juice, and make mouth-meltingly good treats! The ginger syrup is perfect for making homemade ginger soda or cocktails (Dark and Stormy or Moscow Mule, anyone?) The candy makes a tasty snack and is also great for baking into breads and pies. Raised on pasture in the understory of our orchard, you can always tell by the bright orange yolk how much these girls forage for bugs and greens. Stop by anytime to grab eggs from our on-farm store at 200 Creamery Road in Brooktondale, or order online for on-farm pickup. This divine juice concentrate is similar to an old-fashioned soft drink known as “shrub” – basically fruit juice combined with honey, sugar, apple cider vinegar, and lemon juice. It is designed to be added to fizzy water to create homemade soda. Aronia is considered a “superfruit” with higher amounts of antioxidants than blueberries, and many anti-cancer and anti-diabetic properties. 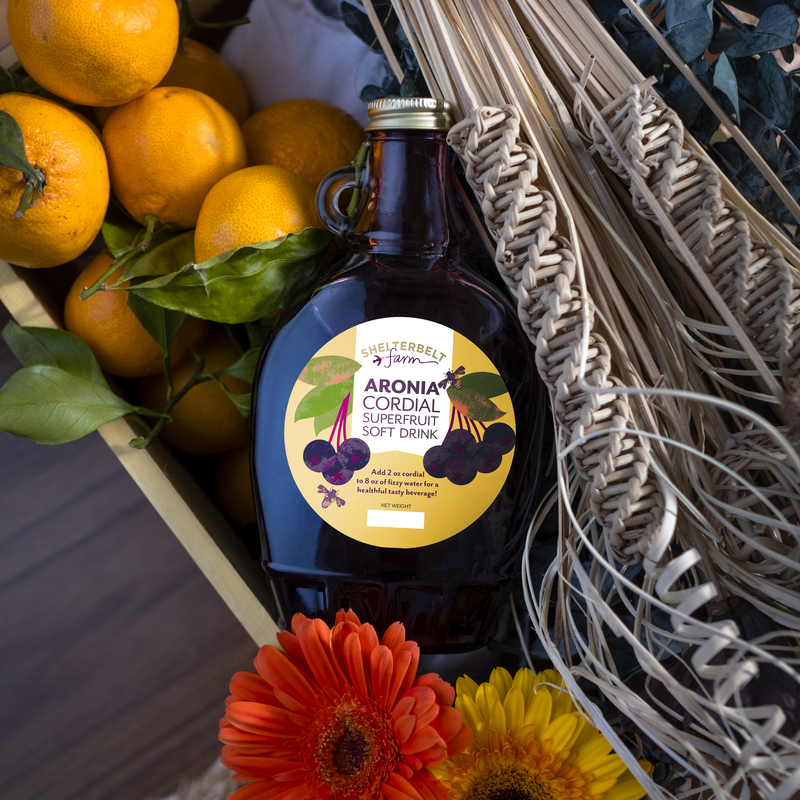 Our aronia cordial is also good in cocktails. Try the Aronia Fizz, a combination of aronia cordial, elderflower liqueur, vodka, and fizzy water. Please “like” us on Facebook, follow this blog, join our “inner circle” email list to hear about farm news and products as they’re available!